On Monday, Sarkozy, Merkel and Medvedev will sit down to discuss a new European conception of global security. With the current order dysfunctional and inadequate, it is not before time that Russia is included in the discussion, writes Mark Leonard. The French seaside resort of Deauville came to prominence in the late 19th century – a time of grand hotels and swanky casinos. It was also a time when Europe was divided up between great powers who each jealously guarded their own little patch of Europe, with individual spheres of influence scratching up against each other. It is therefore a fitting location for a summit meeting involving three of the continents’ perennial great powers – Germany, Russia and France (Monday 18th October) – at a time when Europe is once again becoming a multipolar continent. 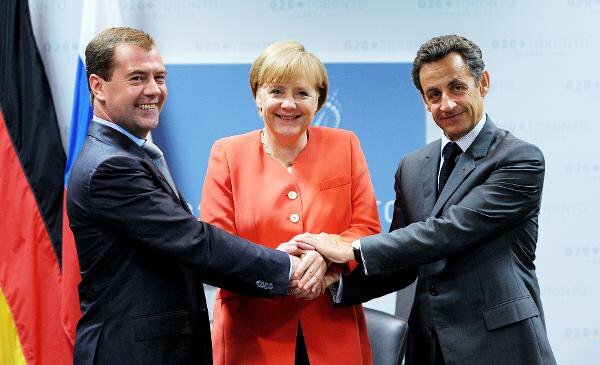 Will the Normandy summit bind Medvedev, Merkel and Sarkozy in pan-European matrimony? Photo www.kremlin.ru. Angela Merkel and Nicolas Sarkozy are reaching out to Russia because they believe European security is no longer a matter for NATO or the EU alone. They are correct. The United States has signalled that it is less interested in European internal security – not least when President Obama declined to turn up for the twentieth anniversary of the fall of the Berlin Wall. The current order is also dysfunctional, failing to deal with wars in Kosovo and Georgia, recent instability in Kyrgyzstan or several so-called frozen conflicts dotted around the continent. The grand project of expanding EU membership eastwards has faltered of late. Even when – as we at the European Council on Foreign Relations strongly hope – Turkey and the Western Balkans become members of the EU, it is clear that NATO and the EU will never be the main security institutions in Europe, covering all European states. There is therefore a pressing need for Europeans to start rethinking their security. But while the summit has the right agenda, it has the wrong participants. Russia needs to be at the table. It never accepted the post-Cold War order, and is now strong enough to openly challenge it. It is, however, also open to engagement, and Medvedev himself suggested working towards a new European security treaty a couple of years ago. Another seat at the table must be given to Turkey, an emerging pole on the European continent. As the country’s foreign minister, Ahmet Davutoglu, puts it, his country is an actor, not an issue. The Turkish sphere of influence ranges from Central Asia, through the Caucasus, Middle East and into the Western Balkans. European influence and interests in this contested neighbourhood, just as with the areas that Russia considers its own Near Abroad, requires either competition or engagement. The EU must be there but many member states cavil at the idea that Paris and Berlin represent them. It would make more sense for the member states to mandate Baroness Ashton as their representative instead. This would both be a response to the Lisbon Treaty while allowing the EU to end the anomaly where the EU – one of the most important suppliers of European security – is not represented in any of the continent’s security institutions. Rather than trying to tinker with the existing institutions, the idea would be to re-invigorate them from the bottom up. By involving Russia in the US-initiated missile defence shield, NATO can build on Obama’s ‘reset’ to cement a continent-wide security identity, focusing minds on external threats to Europe. But alongside this, the EU needs to engage its neighbours in advancing security within Europe. It needs to build trust between Europe’s powers and challenge them to demonstrate resolve – by engaging Russia in solving frozen conflicts such as Transnistria, for instance, or supporting Turkish involvement in Bosnia. A regular informal trialogue could bring together the EU, Russia and Turkey to work on these issues, alongside other interested states. 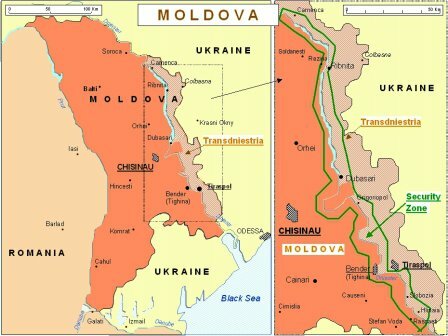 Transnistria is a long scrap of land along the Dniestr river, wedged between Moldova and Ukraine. Mark Leonard: EU needs to build trust between Europe’s powers and challenge them to demonstrate resolve – by engaging Russia in solving frozen conflicts such as Transnistria. The Deauville meeting, and November’s NATO summit looking at the new NATO Strategic Concept, support the feeling that the time is ripe for rethinking European security. The EU has spent much of the last decade defending a European order that no longer functions while hoping for a global multilateral order than will probably never come. ‘The spectre of a multipolar Europe’, which has just been published by the European Council on Foreign Relations, calls for a creative and mature response to a shifting environment, and the demands of Russia and Turkey to be taken seriously as credible actors. To paraphrase Lord Ismay, the goal of rethinking security should be to keep the EU united, Russia post-imperial and Turkey European.